The Pacific War Online Encyclopedia: Brown, Wilson, Jr. Previous: Brown, John H., Jr.
FDR Presidential Library. Cropped by author. Wilson Brown graduated from the Naval Academy in 1902, making him one of the oldest American naval officers to serve in combat during the war. He had been a staff officer with the Atlantic Squadron during World War I and had commanded a destroyer. Between the wars he attended the Naval Staff College and commanded the New London submarine base and battleship Colorado. 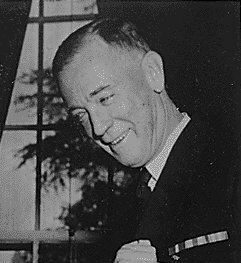 He was the naval aide to President Roosevelt in the 1930s, and Roosevelt was sufficiently impressed to see to it that Brown was appointed superintendent of the Naval Academy. Brown had also played an important role in amphibious planning for Pacific Fleet in 1941. The attack on Pearl Harbor found Brown a vice admiral in command of the scouting forces of the Pacific Fleet. Though not an aviator, he was placed in command of the Lexington task force. This force played a key role in the early U.S. carrier raids, including the dramatic Lae-Salamaua raid across the Owen Stanley Mountains of New Guinea. Although King believed that Brown was "pretty good", his deteriorating health led King to have Nimitz moved him back to Pearl Harbor as commander of his amphibious forces. Brown subsequently fell ill and was reposted to Boston as commandant of 1 Naval District. He then served as Roosevelt's naval adviser, retiring in 1944 from active duty in the Navy. Brown was "an intelligent paragon of old school formality" (Lundstrom 2006.) His age was evident during his stint in command of combat forces, where he was dubbed "Shaky" by junior officers on account of his slight head tremor.